Whether they are called micromarkets, kiosk markets, self-service markets, automated markets or open door markets, the result is the same: happy, healthy employees. One of the many things we love about our open door market concept in addition to day and night access to healthy, good tasting food is how easy and convenient they are to use. Just shop, scan and pay. Imagine one of your employees is working late on a project. She is hungry but doesn’t want to leave the building—it’s raining or it’s too cold and dark outside or she simply doesn’t want to waste time. All she has to do is visit the custom designed open door market Monumental has installed for you right in your building. There, she will find a well-lit space full of baskets of fruit, shelves of protein bars, sleek vending machines with healthy drinks and other snack options (and, yes, if you wish you can still offer some of the less-healthy favorites for those times when your staff just needs something sweet or salty). If she is concerned about nutritional content or ingredients she can read labels and then decide whether or not to purchase an item. If she chooses not to, there are no erroneous charges to contend with like in hotel mini bars. So, assume she has decided to buy that Chobani strawberry yogurt she selected. She simply scans it at the self-service kiosk and pays for it with her Monumental Market card, her employee badge (if your company chooses that as an option) or with her debit or credit card. Monumental Markets accepts American Express,Visa, MasterCard or Discover. Within minutes, she can be back at her desk, hunger satiated! And, don’t worry about theft. Monumental’s unobtrusive security cameras and monitoring systems keep our open door markets secure and visitors and employees honest. 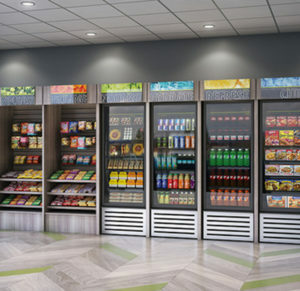 Additionally, due to our innovative displays and Energy Star equipment, a Monumental Market open door market is green and uses half the power of traditional vending machines. Moreover, a Monumental Market open door market is reliable. Our cutting edge technology means your market will always be stocked with lots of great options and you won’t have to deal with broken vending machines and refunding money. In fact, allowing your employees to use a Monumental Market card as a mode of payment makes your life even easier. As mentioned above, our cards can be loaded with all major credit cards as well as debit cards or cash. No more digging through desks or purses for exact change or cash. With a Monument Market card, employees can monitor purchases and even reload cards online. As an added benefit, you can provide Market cards to visitors allowing them to eat on site. Another perk many of our customers enjoy is the ability to give Market cards to employees as gifts for special occasions or as recognition for a job well done. Everyone loves free food and with a Market card that recognized employee can pick exactly what she wishes! You can even decide to participate in Monumental’s customer rewards program which will allow for further food-related benefits. With a Monumental Markets open door market gone will be the days when stale doughnuts lie around the break room long after they’ve been picked over. Top all this off with the more than 20 years of outstanding customer service and your decision to choose a Monumental open door market will be one both your staff and customers will be talking about for years!